Fun Fake News: “Assault’ in the Cathedral?” Pope Attacked by Crazed T.S. Eliot Fan! “Assault’ in the Cathedral?” Pope Attacked by Crazed T.S. Eliot Fan! Just like Archbishop Thomas Becket of Canterbury Cathedral in that poetic drama by T.S. 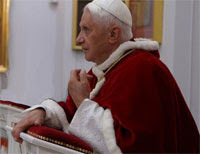 Eliot: ‘Murder in the Cathedral’, Pope Benedict XVI found himself assailed in St. Peter’s Basilica just before he conducted Christmas Eve Mass today. Fortunately he was not murdered but just tackled to the ground by his obviously psychologically disturbed assailant, a 25-year-old woman and three of her “invisible” co-conspirators. Police also found a copy of T.S. Eliot’s ‘Murder in the Cathedral’ on the assailant’s person. So it is believe she had more on her mind than just tackling the Pope. Although police are still attempting to piece together any attempted murder plot, they have gathered up some other interesting clues as well. Witnesses also placed the assailant outside St. Peter’s Basilica hours before the assault, reading passages of T.S. Eliot aloud to herself and feeding stray cats. "It was those same cats that distracted the Pope's personal bodyguards and everyone else’s attention away from that woman for a moment," says Diego Martinez, a tourist from Mexico. Martinez claims, as do others, that they heard a chorus of cats signing just moments before the assault took place on the pontiff. Moments later, the Pope fully recovered from the assault suffering only minor burses and abrasions, walking away to perform Mass without further incident. Although a French Cardinal with more serious injuries had to be hospitalized, he is expected to make a full recovery as well. Police say the young woman will undergo psychological evaluation and likely be charged with assault, plagiarism and copyright infringement of an internationally protected intellectual property.